Today I have the other Pomegranate Lacquer shade that Susan who owns Star Trinkets kindly sent me to try out a little while ago. Purple is one of my favourite shades and I'm on a bit of a purple kick at the moment so Improv Show fit the bill perfectly! 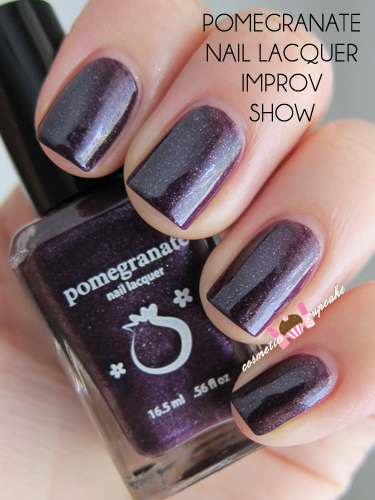 Improv Show is a dark purple with silver, blue and pink shimmer through it. Unfortunately you can't really see the shimmer in my pics (doh!) but it's definitely there and really adds to the gorgeous purple. It's perfect for the cooler months! Application was a breeze and dry time was good. 2 coats is pictured. Thank you Susan for sending me this beauty to try! You can check out my swatches of Pomegranate Lacquer Cardigan here =) Thanks for looking as always! Me encanta el color y el efecto! Love this color. So beautiful. This is gorgeous! I have so many Pomegranate polishes on my wishlist! I love purple nail polishes. This one is pretty! Love it!!! Love the color for I find it classy even though it is simple. This is perfect for any occasion.